We talked with one of our more active advocates about why she’s excited about the prospect of a streetcar in Omaha. 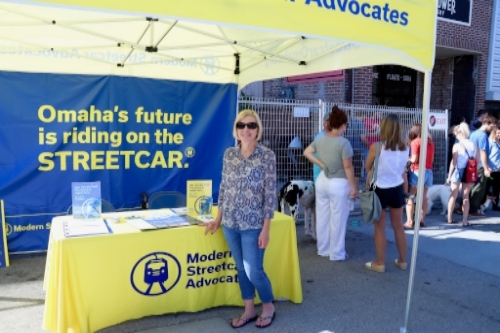 Janet lives in the midtown area, and recently volunteered with Modern Streetcar Advocates at an event. Thanks for sharing your perspective, Janet! MSA: What would a streetcar in Omaha mean to you? Janet: As a resident along the route, it would blend the neighborhoods for me. It would eliminate the division between them and make it all seem like one big community. Transportation would be so much easier – you wouldn’t have to worry about meters. MSA: Why have you chosen to support the streetcar movement? Janet: I travel to Denver often, and I use the light rail system there all the time. It’s so easy to get from the airport to practically anywhere. I think if people knew how easy and smooth it is, it would be a no-brainer. I’d love to see something like it in Omaha. MSA: Why should others support the streetcar? Janet: It will make Omaha so much more competitive. We’re already a great city, but imagine how much better we’d be if we had an easier way to get around town.